There are somethings that seem to want to take us a step or two to the side of of our usual reality. It can happen when we speculate on something we can't experience. It can be found in something as simple as the curve in a tree or a mood evoked. And sometimes we are asked to explore what we are and rethink what may be. It is believed by some that the Raven embodies the energy of transformation and can show us how to eliminate our inner demons. In this painting I treat the Raven as both a servant and a spirit guide. 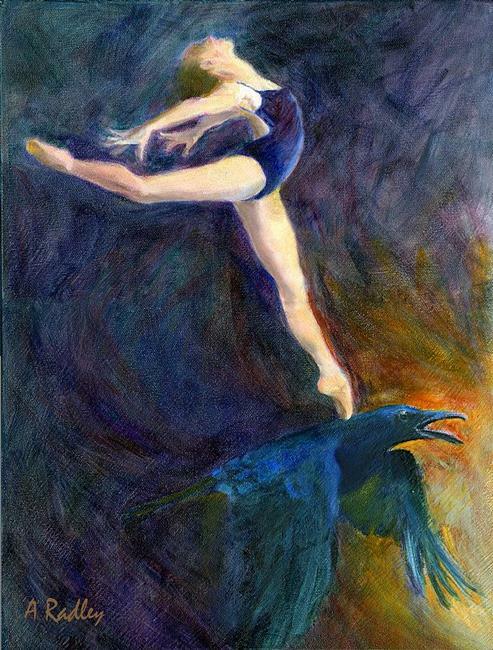 The Ballerina draws from the Ravenâ€™s strength and has the courage to put her fears aside and reach her full potential. Using the Raven as a springboard, there is no limit to what she can achieve.